Welcome to PWC Chiropractic! We’re excited that you’re considering a visit to our office. Check out what to expect here. Get to know us. Then, contact us to make an appointment so we can get to know you. I loved how friendly and easy to talk to all the staff members were! Great first chiropractor experience! Want to know what other people think? Here’s what our patients have to say about us. Prior to your first visit, we ask that you complete your new patient paperwork in full. The more information we have about your health history, the more we can help, and therefore we ask that you take your time filling it out with as much detail as you see fit. Upon arrival you will be warmly greeted by one of our amazing front desk staff, who will take your paperwork and then give you a tour of our beautiful office so you know where things are and what to expect. They then will take you to the Exam Room where the doctor will first meet with you to begin the consultation and exam, which incorporates many aspects, but with three main categories. First our doctors will go over an extensive history with you in regards to your current and past health challenges, if any. Second, we will spend time explaining how chiropractic wellness care works, and specifically how things are done in our office. We strongly feel that the more we know about you, and the more you know about us, the more we can help, and that is our primary mission. The third component is likely the most important, and is begun once the consultation is done. This component is our comprehensive examination. The exam done at our office is very thorough and expansive, allowing us to figure out exactly what is going on with your health, and what the true cause of your challenges are. We perform a computerized exam that allows us to measure the amount of stress on your central nervous system. This test is the foundation of our exam. 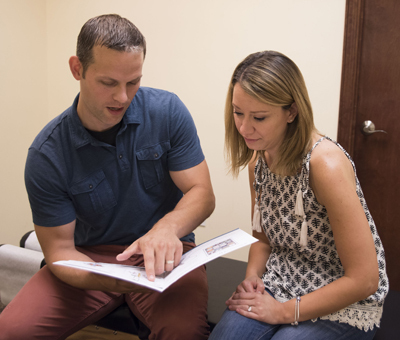 Our office specializes in the treatment of Neuro-Developmental and Sensory Processing Disorders, so in these cases a specifics sensory-based assessment will be performed for your child, in addition to the other components. The major emphasis of our initial exam is to evaluate your spine and central nervous system, determine how it is functioning, and find where the stress and challenges are that will need to be addressed. The doctors will then go over all the information gathered on this first visit and create a specific treatment plan to address and remove your current health challenges. This first day is very comprehensive, but should still be finished in about an hour. On your 2nd visit, our front desk staff will again greet you and get you checked in for your appointment. You will then be taken to the doctor’s office where one our doctors will go over all the results of your examination. We refer to this as your Report of Findings. This is also the time where you have the freedom to ask any and all questions you may have. The doctors will explain the results of the scans that were performed. The scans have 2-3 components depending on what was done, and each will be explained and related to your specific condition or challenge. Again, this is the most important piece as you will be re-scanned on a very specific schedule in order to track and document your functional improvements. It is very important to us that you have a good understanding of what is going on with your spine and central nervous system, so again questions will be taken throughout the entire Report of Findings. Lastly, we will go over the details of your treatment plan and answer any and all questions you may have. Most treatment plans consist of three phases, and those will be explained. If any additional consultation, examinations, referrals, or any other form of additional testing is recommended, we will go over those as well. The entire 2nd visit should again take about an hour, and will finish with scheduling of your next appointment. On a typical visit during the course of your care, you will always be greeted warmly by our incredible front desk staff. They will first have you sign in electronically for your appointment, and then get you set up for your care. Every part of the care in our office contributes to the process designed to restore your health and wellness. So while you will likely have more frequent visits in the beginning you will be seeing progress with each step along the way! Dr. Tony is committed to educating the Crystal Lake community, and holds regular classes/workshops covering everything from nutrition and fitness, to ADHD, vaccinations, allergies, stress reduction, time management and more.